This sub-$400 laptop delivers great value. The Acer Aspire E15 (E5-576-392H) is a bargain laptop that delivers solid productivity performance. Given its low price, mainstream users may be willing to overlook the laptop’s extra weight, so-so display and lack of keyboard backlighting. But if you have any high-demand applications (or a bit of a gaming bug), it would be better to consider one of its pricier cousins. 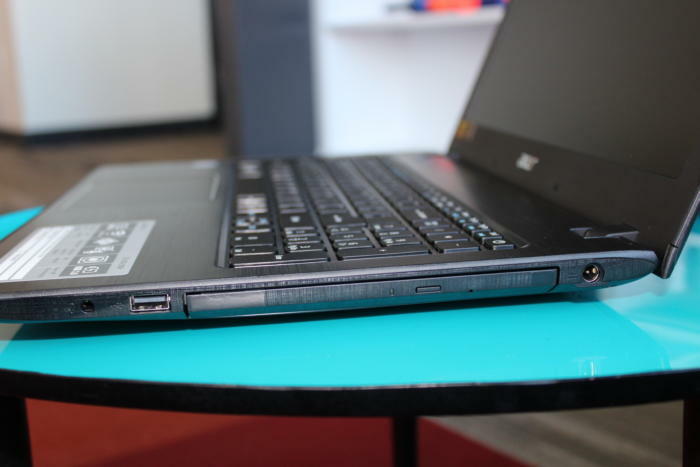 Note: This review is part of our best laptops roundup. Go there for more information about competing products and how we tested them. This $379 Acer Aspire E15 (E5-576-392H) comes with an 8th-generation, dual-core Core i3-8130U processor (which sits on the low end of Intel’s line of Core CPUs for laptops), 6GB of DDR3 RAM (up a couple of gigabytes from last year’s budget model), and a 1TB hard drive. For visuals you get a 15.6-inch HD (1920x1080) display, integrated Intel UHD 620 graphics (so don’t expect much in the way of gaming), and a feature that you’ll have a hard time finding on a laptop anymore: an honest-to-goodness 8X DVD-RW optical drive. We’ll dive into benchmark numbers in a minute, but based on the raw specs, the 8th-gen Core-i3-powered Acer Aspire E15 stacks up nicely as an everyday workhorse, perfect for web browsing, productivity applications, casual photo editing and even spinning your old DVDs. That’s a pretty impressive package for a sub-$400 laptop, and it’s easy to see why this model regularly sits at the top of Amazon’s laptop best-seller list. If you’re looking for a peppier Aspire E15 that can handle more CPU-intensive tasks and even some gaming, you can spring for a $599 version (The E5-576G-5762, which we've reviewed), which boasts a quad-core Core i5-8250U processor, a discrete Nvidia GeForce MX150 graphics card, a 256GB solid-state drive, 8GB of RAM, and a better IPS-technology screen. There’s also a $799 Aspire E15 that ups the ante with a Core i5-8550U CPU. Measuring 15 x 10.2 x 1.2 inches and weighing about 5 pounds, 1 ounce (or 5 pounds, 10 ounces if you include the 65-watt power brick), the Core i3-8130U version of the Acer Aspire E15 looks and feels almost identical to last year’s budget model—which is to say, sleek and professional but unquestionably on the heavy side. While the Aspire E15 is no ultraportable, good luck finding a slim-and-light clamshell with similar specs for anything less than double the price. 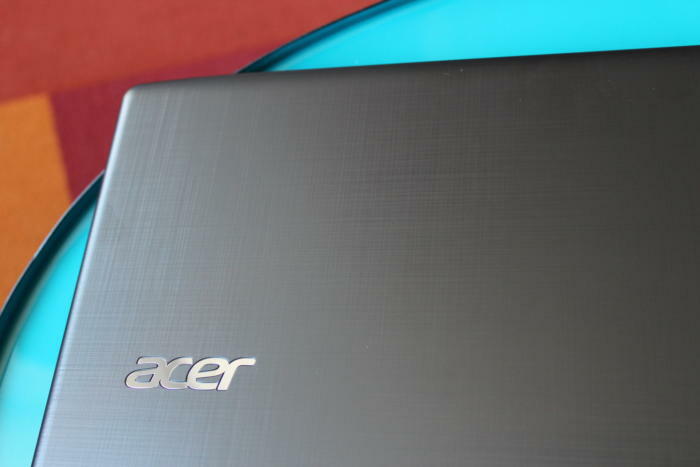 The Acer Aspire E15's etched lid looks both understated and professional. The E15’s etched lid looks understated and reasonably stylish, while the brushed aluminum finish of the palm rest looks pretty sharp. The plastic feel of the E15’s shell may give it away as a budget model, but the laptop as a whole still feels reassuringly sturdy, complete with a stiff display that barely wobbled as I typed. My only real complaint (a repeat from last year) is that the slide-out DVD tray feels worryingly flimsy. One particularly thoughtful design touch on the Acer Aspire E15 is a removable bottom panel that gives you access to the RAM slots and drive bay, handy for upgrading the E15’s meager 6GB of memory. Opening the panel is a simple matter of loosening three screws and pulling on a thumb tab. The Acer Aspire E15’s 15.6-inch display comes with the same pluses and minuses we saw in last year’s budget model. Viewed straight-on—and I do mean directly straight-on—the screen looks reasonably sharp and vivid, perfectly adequate for browsing the web, editing Word documents or fiddling with pivot tables. 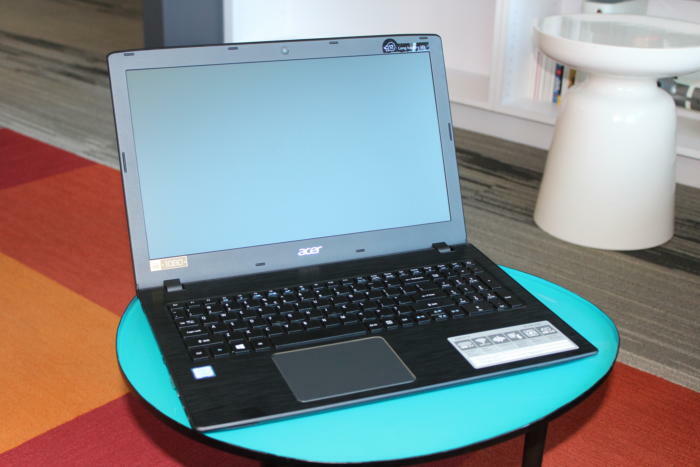 The Acer Aspire E15's non-IPS display looks blown-out or even inverse when viewed from an angle. However, the Aspire E15’s display betrays its budget pedigree once you move your head side-to-side or tilt the screen up or down. Indeed, brightness and contrast vary wildly depending on the viewing angle, and the display blows out and goes inverse as you tilt the lid down. These are the telltale signs of a non-IPS display, and it goes with the Aspire E15’s sub-$400 territory. The E15’s display is also disappointingly dim, registering only 230 nits (or candelas) according to our measurement; we prefer a reading of at least 250 nits. I had no trouble viewing the Aspire’s display while in my den, but expect to squint if you’re using the laptop near a bright window or outdoors. No question about it: the $379 version of the Acer Aspire E15 has a keyboard with a distinctly budget feel, manifested in the matted design of the key caps, the slightly bendy middle of the main keyboard, and the lack of backlighting. The squished 10-key numeric keypad (which also appears on pricier models of the E15) is a bother, as is the funky design of the navigational arrows. The Acer Aspire E15's budget keyboard lacks backlighting, but it was still a pleasure to type on its snappy keys. That said, I actually enjoyed my time typing on the Aspire E15’s keyboard. Boasting a decent amount of travel, a nice tactile bump in the middle of each keystroke and a springy rebound, the Aspire’s keys felt snappy and refreshing. Kudos to Acer for doing a lot with a little in the keyboard department. 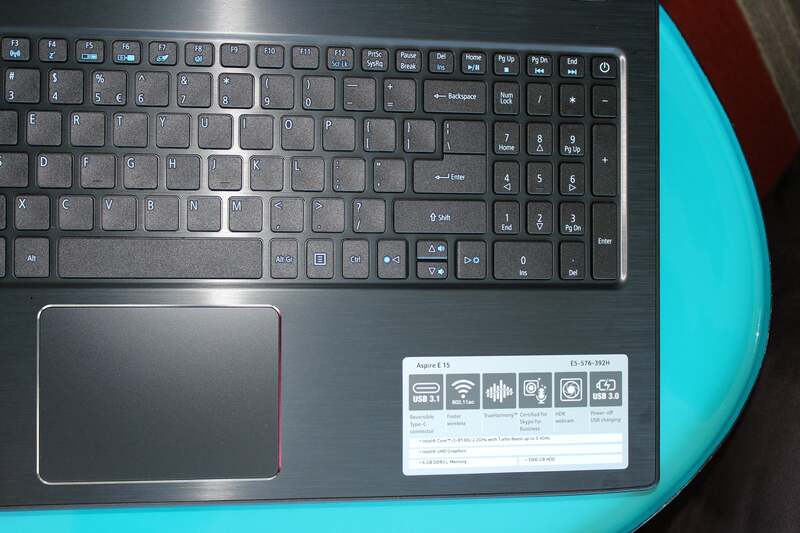 The Aspire E15’s mid-size trackpad sits centered beneath the space bar, which means it’s actually somewhat left of center thanks to the numeric keypad on the right. The E15’s trackpad is pretty much par for the course as far as budget laptops go: smooth and responsive, a tad tough to click, and prone to the occasional mistaken input for your palms. Also standard-issue are the Acer Aspire E15’s down-firing speakers, which deliver loud but somewhat squished and muddy sound, with essentially zero bass. The fact that the E15’s speakers sound decent at all is impressive given the laptop’s price tag. If you’re planning to bliss out on Spotify, go ahead and plug in a pair of headphones. Acer claims the 720p webcam in the top bezel of the Aspire E15’s display boasts HDR (High Dynamic Range) technology, and indeed, the video captured by the camera includes bright spots punctuated by deep shadows. On the other hand, the video looks so muddy that the image appears out of focus, rendering the camera useless for all but the most rudimentary Skype chatting. Those looking for Thunderbolt 3 ports on Acer's budget-minded Aspire E15 will be disappointed, but if you’ve got an old VGA display you want to connect to your laptop, get ready to be happy. On the left side of the i3-powered E15, you’ll find a USB 3.1 Type C port (up to 5Gbps), an ethernet jack (with a hinged dropjaw), a VGA port, a full HDMI port, and a pair of USB 3.0 Type A ports. Also on the left side: a Kensington laptop lock. 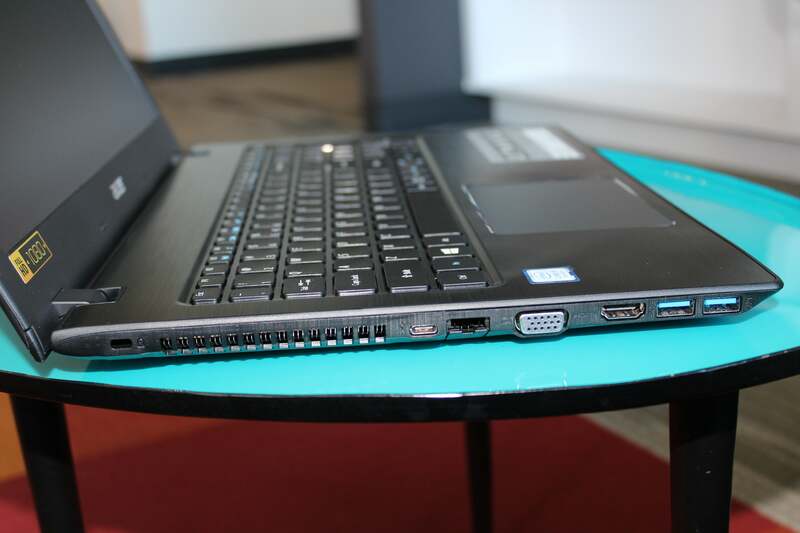 Among the left-side ports on the Acer Aspire E15 are USB 3.1 Type C, an ethernet jack, and a VGA port. On the right, you get a barrel-shaped charging port, the aforementioned DVD tray, a USB 2.0 Type A port, and a combo audio jack. The Acer Aspire E15's DVD drive is a rarity in laptops these days. The Acer Aspire E15's budget status means you need to manage your performance expectations. The integrated Intel UHD 620 graphics can't do much in the way of gaming (I could barely get Fortnite to run, even on its lowest setting). Its Core i3-8130U processor is the lowest-end Core laptop chip available, a mere dual-core in an otherwise quad-core family. But it has one secret weapon: a Turbo mode that can take it from its base clock of 2.2GHz to as high as 3.4GHz. That can come in handy on certain jobs. We didn't have other Core i3 laptops to compare it to, so it's going to come in at the bottom compared to the quad-core Core i5-8250U we had on hand. But as we’ll see in the moment, those simply needing to surf the web, manage their photo libraries or get things done with Office should be satisfied. Because most Acer Aspire E15 owners will probably be using it for everyday computing duties, we jumped right in with PCMark 8, a benchmarking tool that simulates such typical desktop activities as web browsing, word processing, spreadsheet tinkering, and video chat. Any score over 2,000 is good here. The Acer Aspire E15's PCMark score looks low because it's a dual-core machine up against a bunch of quad-cores, but it's still well over the bar for capable everyday productivity. 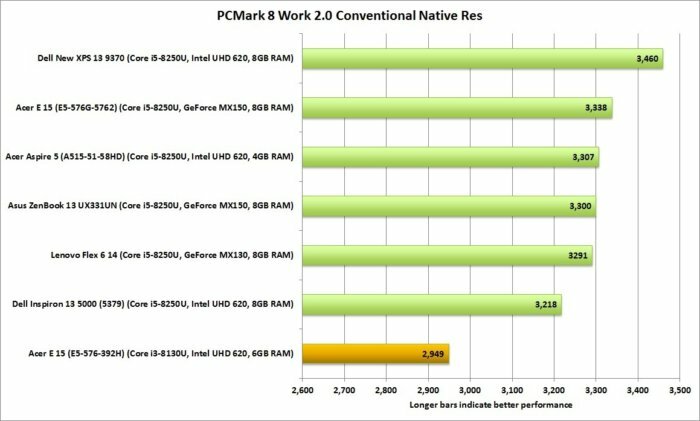 Last year’s budget Aspire E15 snagged a pretty decent PCMark 8 result of 2,500, and this new 8th-generation model posts an 18-percent improvement. In anecdotal everyday use I was consistently impressed with the pep of the Core i3-powered Aspire E15, even given its traditional hard drive (which is much slower than the SSDs you find on pricier models). Composing Word documents is one thing, but encoding video files is quite another. Our next test involves converting a 40GB video file into an Android tablet format using the free HandBrake utility, a task that puts considerable strain on even the most souped-up CPUs. 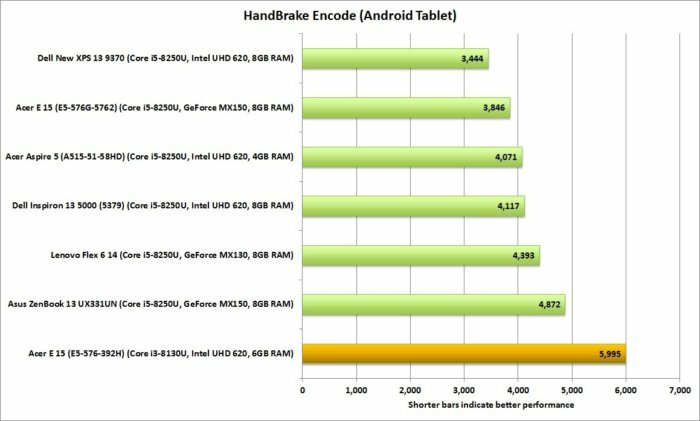 The HandBrake encoding test is hard on a CPU, especially a dual-core like the Core i3-8130U, but it isn't too far behind some quad-core competition. 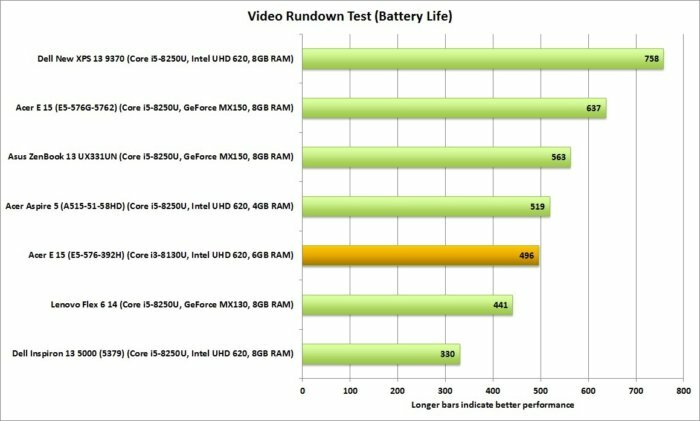 While it falls well behind compared to the quad-core laptops in our comparison chart—no surprise, given that this particular benchmark favors systems with the most cores—the Acer Aspire E15 notches a respectable score given its dual-core processor, not to mention a solid uptick over last year’s budget E15 model. Still, it should be noted that the Aspire E15 labors mightily to achieve its Handbrake score. We observed CPU temperatures spiking above 92 degrees Celsius (197.6 degrees Fahrenheit), and the system repeatedly engaged thermal throttling to cool things off. Another CPU-intensive benchmark, our Cinebench test involves rendering a 3D image in real time, a task that pushes laptop processors to the limit. Unlike the lengthy Handbrake test, Cinebench only takes about five minutes to run, giving us a good idea how a particular system handles short bursts of stress. Running Cinebench on a single thread, the Acer Aspire E15 could keep up just fine. 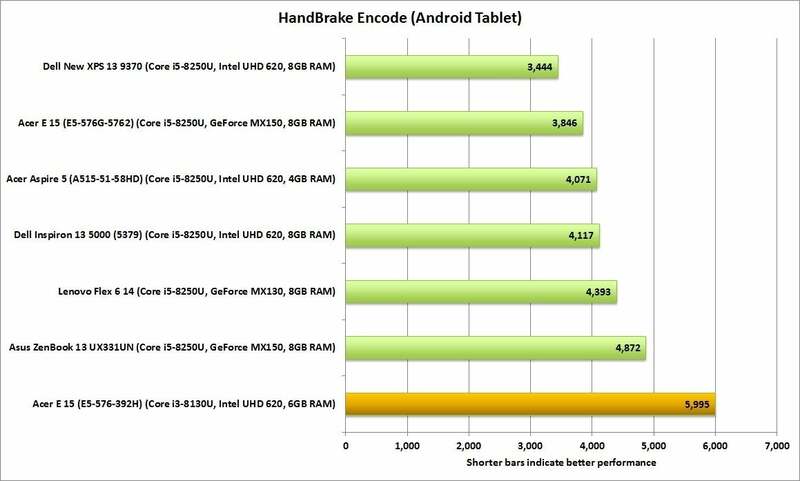 When we upped the ante to multi-threaded performance, its dual-core status couldn't keep up with quad-core competition. We ran the test in both single-threaded and multi-threaded mode. Few applications are multi-threaded, but this test shows off the capabilities of higher core-count chips. 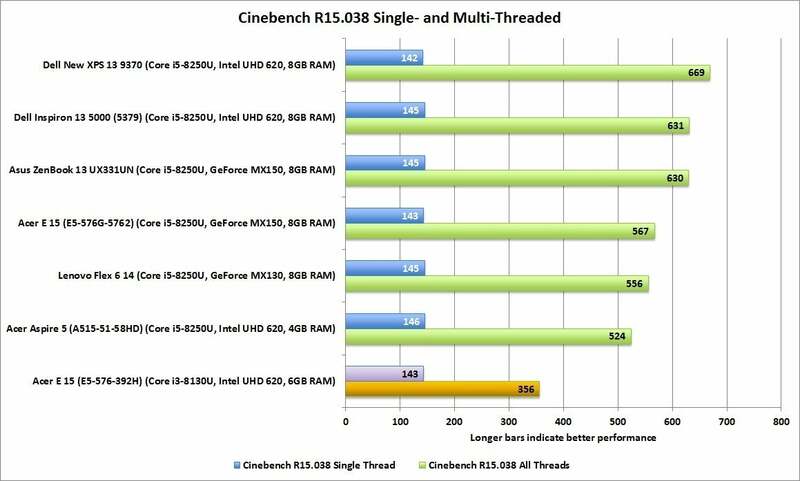 In other words, more cores are better when it comes to Cinebench. It shouldn’t come as a much of a shock that the Core i3-powered Acer Aspire E15 brings up the rear in our comparison chart, behind a series of quad-core laptops. That said, the new budget E15 again shows an impressive uptick over last year’s version. We test battery life on a laptop by looping a 4K video using the stock Windows 10 video player, with screen brightness set at about 250 nits (or, in the case of the display-challenged Acer Aspire E15, its subpar maximum of about 230 nits). We also dialed the speaker volume to 50 percent, with headphones plugged in. 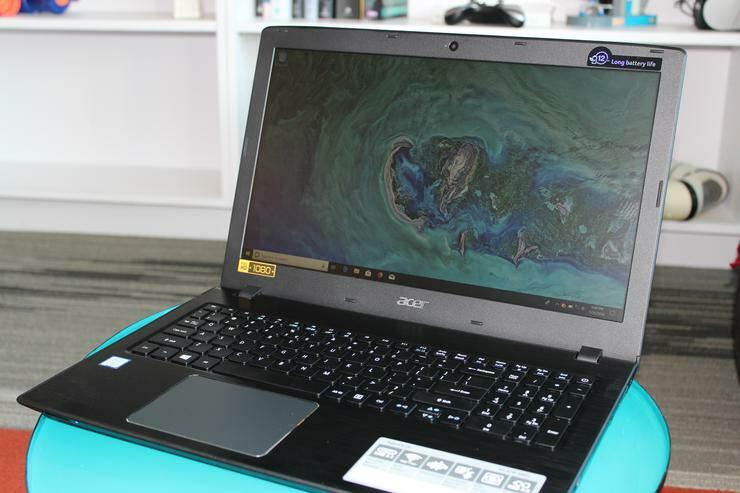 The Acer Aspire E15 lasted 8 hours and change in our video rundown test, a good midrange duration that should get you through the workday. The Aspire E15’s 496-minute result (about 8 hours and 15 minutes) is a slight improvement over last year’s budget E15, but it’s also more than two hours shy of the battery life of this year’s $599 model, which boasts the same 62 watt-hour battery.